Congratulations to our Bridgeton trainees who have just completed their “health week” – healthy eating, healthy cooking, swimming, keep fit and climbing at the Skypark! Congratulations to the 10 young people on Right Track's most recent Launchpad Programme who have all achieved their Personal Achievement Bronze Award and have progressed to the Accelerate Project and will work on their Personal Achievement Silver Award. Well done to all as everyone passed every single Launchpad challenge! Jay Malone left Right Track to take up employment in his work taster at Select Blinds in Coatbridge. Jay started Right Track at Coatbridge on our Stage 2 programme. He was a quiet, shy boy who was unsure about his career choices and was looking for direction and support in this area, and also to improve his grades. Jay successfully completed SQA qualifications at Level 4 –Numeracy, PD Practical Abilities and Information & Communication in our training centre. Jay was offered a work Taster at Select Blinds, as an introduction to the world of work. Initially shy and very quiet, he became more self confident, engaged with the staff and his attendance was 100%. Jay was determined to make the most of his time as this had opened up new areas for him and he was willing to learn new skills that he hadn’t considered for himself. Jay was offered full time employment at Select Blinds in the production area. We are all very proud of Jay's achievements and wish him all the best for the future. We currently have a range of young people gaining work skill in a variety of areas throughout Glasgow and Lanarkshire, some with opportunities for permanent employment in the future, while others focus on giving our participants experience and confidence boosting tasters for a short time. For those looking for experience and increased levels of confidence we have a variety of tasters available in Hairdressing in the Hamilton & Blantyre areas, Children's activity and play centre in Airdrie and Retail throughout Glasgow and Lanarkshire. For those seeking permanent employment we have placements available in garages in Partick, Carpet and flooring companies in Drumchapel, the waste management facilities in Coatbridge, car wash/valeting centre in bellshill and many more. If you are interested in any of our courses, get in touch with your nearest centre for more information. Well done everyone and good luck for the future! Congratulations to Stacey McAslan who has secured a job in DiMaggio's in East Kilbride and is now training to be a Commis Chef. We wish her all the best in the future. Our next Launchpad Programme starts w/c 17th and 24th of July. This Project has been highly successful and it is first come first served for a place. If you want to do outdoor activities, team-building, confidence-building, try things you have never tried before, make new friends and feel really good about yourself, 3 days a week, for 6 weeks, with travel and an allowance of £30, it is first come first served. Shannon McKenna, a former trainee, who previously attended Right Track keeps in touch with us on how she is progressing in her Career as a Dog Groomer. Shannon recently contacted us to advise that she has been contacted by the Dog Groomers’ Association in Germany and they have advised her that she is to be presented with The Aesculap Scholarship at Crufts this Friday (10 March 17). It's an Achievement Award based on her Portfolio and Dedication to the Industry and the achievements she has accomplished in such a short time. This Award has been given to only 5 groomers throughout the UK (it's quite a prestigious award). Shannon will be given Masterclasses by some of the renowned Tutors in the Industry along with free Seminars and a range of grooming equipment! There will be an article in the Grooming and Pro-groomer magazines on Shannon re. the above. Shannon can’t believe how far she has come in such a short time and expressed her thanks to everyone at Right Track who helped her onto the ladder of her Career. Everyone at Right Track are all delighted for Shannon and wish her all the very best in her dedicated career! When Junior started on our Stage 2 Employability Fund Programme, he requested a placement in a garage as he was very interested in mechanics. We offered Junior a placement in a garage in Rutherglen, which was a new placement company we had recently secured. Junior attended his placement at the garage, however he felt the mechanic he was working with was not too interested in him. Junior spoke to us re. this and we decided to speak another garage that we have worked with before. Ann then spoke to Jim Scott at Scott Brothers and secured a placement for Junior. Junior attended the placement and was happy there. Junior attended Centre after a few weeks for day release. While doing job search in the Centre Junior mentioned he knew someone who worked with a flooring company and said he would like to look into an apprenticeship as a Floor Layer. Junior had a good attendance and timekeeping record and we knew he had the attitude an employer would appreciate. Junior attended an interview and was successful with the flooring company. Junior has now completed 8 weeks of employment and when he came into the Centre for a visit, he said he loved his job and was earning great money. Junior spoke to the other learners about his job, which I am sure, helped the other learners to realise that they could also secure employment if they put their mind to it. Junior is a hard working very well mannered young man and we are delighted he has been given this good opportunity, which he deserves. The morale of the story - if you open up to new ventures you may just succeed, and if any of you are looking for a Floor Layer in a few years speak to Ann who has his number! Our Employability Fund Stage 2 trainees collected food for hampers for the elderly. There is a photo in our gallery of the trainees at a local community centre with 2 of the ladies who received a hamper. Melissa Wright has just completed her PD Award. Melissa worked at collecting toys, books, etc. for Yorkhill Hospital. Please see photo photo in our gallery of the Employability Fund Stage 2 Trainees delivering the toys to the hospital. Low Parks is an approximately 125 hectares of land, designated as a Site of Special Scientific Importance (SSSI). It is comprised of a mosaic of habitats, from ponds and woodland to marshland and meadows. The area has been used for informal recreation, it has no constructed path network, and has had low levels of management input for approx. 50 years. •	Two boardwalk-type bridges were replaced due to rot caused by a blocked drain and the drain was cleared. •	Trees around the ponds were thinned out. •	A large area of the site was litter-picked. A big thank you to all the partner organisations and volunteers who worked hard on the day to make it a successful event and thank you to Land Services for supplying the litter pickers, bags and organising the uplift of the rubbish. Our trainees on our Launchpad Programme had great fun making pumpkin lanterns - have a look at our photos. Our Glasgow and Lanarkshire Centre raised a total of £238 from their McMillan Coffee afternoons. Both of these Centres are not on a public thoroughfare so this was a great effort for everyone who participated. We have completed another Launchpad and 7 out of 8 of the young people enjoyed it so much they asked to start with Right Track on the Stage 2 programme. All the young people said Launchpad was a very positive programme and they have given some good feedback for future programmes. Well done to all our trainees and staff who made cakes, donated raffle prizes and most importantly raised funds for this worthwhile cause. 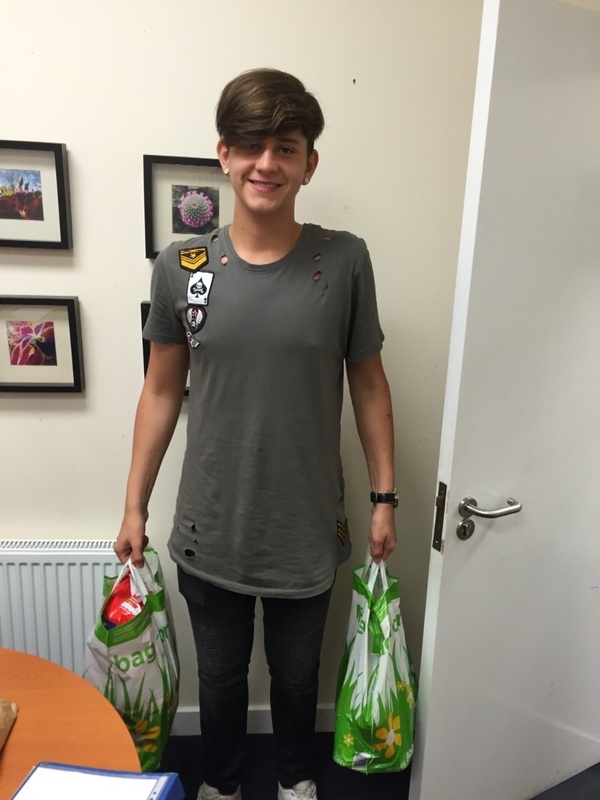 Well done to Sebastian Palzkowski for collecting food items for the Trussell Trust's Foodbank. Sebastian did this as part of his Personal Development Award. Shaleen Boyle, who is one of the Launchpad Trainees at the Coatbridge Centre, started 4 weeks ago. Shaleen stopped attending Fir Park school in S3, which is a secondary school for pupils with special needs. Shaleen suffered from anxiety and low confidence as well as struggling with basic literacy skills. Shaleen has also had speech therapy in the past and struggled filtering information. I believe she had also been the victim of bullies. On her initial visit we were asked if she could be accompanied by her parent / social worker (who are both very supportive), but Maria interviewed Shaleen on her own and put her at ease. I am pleased to say that Shaleen has flourished on the course. She has not missed a day so far and is the most enthusiastic trainee I have ever had. She has had a go at every activity and encourages others who feel they cannot participate. She has completed her Personal Achievement Award and although she struggles to write, will watch as I scribe and ask me to go over it again. She is also an amazing sportsperson who has overcome so much and we have spoken about her progression already as she wants to get some work experience and knows this will be possible with our support. Shaleen also helps out with her Mum who took a stroke some years ago and is wheelchair bound. Shaleen’s confidence has improved so much and with each activity comes new challenges which she finds new ways to overcome. She also has a great sense of humour and everyone in the Centre who comes into contact with her tells me what a nice person she is. Congratulations to Rachel McGinty on achieving her Personal Finance Award! This is the first of these awards for Right Track as it is a new Award which has not been rolled out to trainees as yet. Right Track has gained approval to deliver the Work Experience Unit and the Personal Finance Award. Congratulations to Connor for winning Right Track's Trainee of the Month for July. 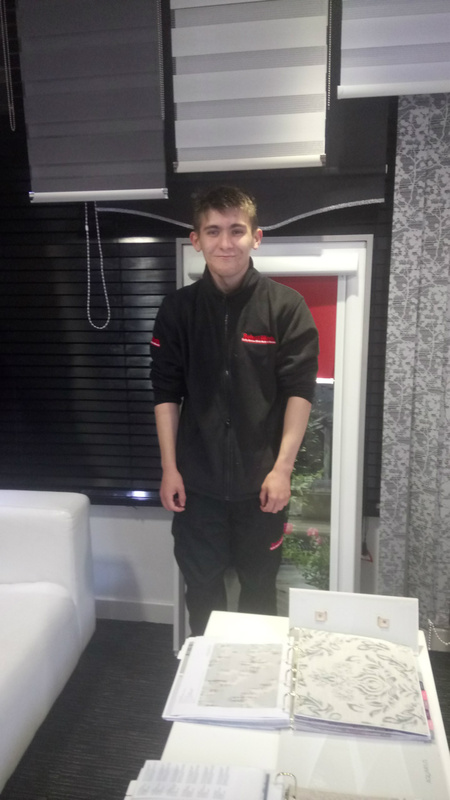 Connor was nominated by the Lanarkshire Staff Team as he had overcame personal barriers and also bullying at his first placement and adventually was offered a permanent job at his second Work Placement after proving that he would be a valuable member of staff. We wish Connor all the very best in his new career! Please see some photos of trainees who were invited for training at the Sky Academy. Everyone enjoyed the day! Two of our trainees Zac Christie and Ross Maxwell are now currently training as Commis Chefs. Good luck to both of you!! First Launchpad Projects nearly complete! Please have a look at our Launchpad photos in the Gallery to see some of the activities undertaken! Currently recruiting for Lanarkshire Launchpad Projects commencing 1 August 2016! Congratulations to Danielle Admas (Coatbridge) and Gary Wilson (Bridgeton) on both achieving their Stage 2 qualifications. Well done to you both!! Trainees at the Coatbridge Centre took part in basic health eating cooking skills and etiquette which they all enjoyed - especially the eating part!! Shaun Sally secured a job with Burtons Biscuit factory and started on 20 June. Allen Blair has been offered a job with Sports Direct and starts on 24 June. Well done to Shaun and Allen - we wish them every success!! Congratulations to Lee on passing his driving test and securing a job with a security firm. Well done Lee!! Congratulations to Chloe McCabe at Coatbridge as she has been successful in moving into employment at her Work Placement at Blair Care Home - we wish Chloe every success for the future. Morag has secured new Work Placements with: Groomers Inc - one of the Bellshill Trainees will be starting Work Experience there on Thursday 16 June; Shoe Zone, Motherwell Town Centre; B & M Drumchapel Retail Park; Lion Cubs Funhouse, Drumchapel and Bellmill Hotel, Bellshill they will offer training in their kitchen for commis chef. Congratulations to all who survived (and enjoyed!) last week's Challenge Life Residential despite the midges!! We offer our sincere thanks to the Bairdwatson Trust for their recent 2nd year Grant in support of our Work Experience provision in Lanarkshire! We offer our sincere thanks to the Garfield Weston Foundation for their Grant in support of Right Track's Skills for the Future Programme! More Qualifications certificated today at Bellshill! Congratulations to the Right Track trainees who achieved the following Qualifications today - really well done! Next round of Barclays Lifeskills Courses! Thanks to Barclays staff who will be offering the next Barclays Lifeskills Course to Glasgow trainees over the next three days. Thanks to the Peter Harrison Foundation! It is with grateful thanks that we received a donation today from the Peter Harrison Foundation in support of Right Track's Challenge Life outdoor activity Programme. Right Track trainee Ross Wilson is on Placement at Free Wheel North, a Project which aims to support everyone to get outdoors and cycle. Trainee, Curtis Barber from Right Track Bridgeton is undertaking his Personal Development Award, part of which is his Project to encourage the group to take part in cycling activities. Good luck to everyone who is taking part on Tuesdays and Thursdays!